Here at Marotta Wealth Management, we love getting to see our clients become grandparents. For many, family is one of their core values in life and the arrival of the next generation breathes a new sense of purpose into them and their finances. Clothing is always a good present as kids are always outgrowing clothes. However, there are two barriers to buying baby clothes: size and price. First, what size should you get? I find that with my own daughter, the rule is twice her age. So at 3 months she was just starting to wear 6 months, and now at 12 months she is just starting to wear 24 months. Does she still fit in 12 months? Yes. But at this point a new 12-month outfit would not get worn enough to justify any price. Second, where can you find affordable baby clothes? Baby clothes range wildly in price. There are thrift stores that claim to have discounts, but actually are used clothes bathed in yucky fabric softener for new prices. Then, there are stores that cater to registries, like Babies-R-Us, which have nice clothes for higher-than-normal prices. It tends to be the weird places with the good deals. We’ve found luck at Cosco stores which sell Carter’s clothing wholesale and on Amazon.com where Gerber clothing packs are often the most affordable with Carter’s as a runner-up. My rule is $4 per item is an okay price. So, three pants for $12 is an okay price. Two shirts, two pants and a onesie is 5, so $20 is an okay price. This principle helps to weed out overpriced items ($20 for one shirt and one pants) as well as notice steals (5 onesies for $10). Recognizable characters pull the price up and sometimes the price varies by sizing and material. Dr. Seuss has been my daughter’s favorite author since she was five months old with Hop on Pop, One Fish Two Fish Red Fish Blue Fish, and Fox in Socks as consistently her favorite three. Most of the lift-a-flap books at my house are coated in a thick layer of duct tape where the poor flaps have been sacrificed to the goal of gaining hand-eye coordination and dexterity. Gotta Go Buffalo is the exception. This large book has the sturdiest flaps I’ve ever seen. We read this one on a daily basis and not a single flap or page is damaged. The cute rhyming goodbyes are perfect for helping make hard goodbyes a little better and the peek-a-boo feel makes my little one grin with joy. Peek-a-Who? is a game book. It has windowed pages to allow various rhyming scenes to peek through (“Peek-a-MOO!”). The last page (a mirror for “Peek-a-YOU”) is my daughter’s favorite. She grins from ear to ear and kisses the book. There are a lot of truck, car, or airplane books out there and I’ve found two that my baby girl and I really enjoy. First, my daughter loves T is for Truck. It has rhyming couplets throughout as well as one fun touch-and-feel spot on each page. My favorite is feeling the snow of the snowplow. My daughter likes the lifting flaps on the fire engine. Second, The Village Garage is a sweet story about the men and women behind the trucks. I must admit that I enjoy this one more than my daughter, but she is steadily engaged throughout the story. When you’re a baby, the whole world is a toy, so there is not much need for single function plastic toys. That being said, there are several types of toys that I’m thankful my daughter has. First, I’m glad she has stuffed animals. Already, we are able to role play scenarios of empathy, comfort, and fun with these fuzzy friends. She hugs them, helps them up when they’ve fallen over, and expresses herself through her play with them. Second, interactive toys have given my daughter her dexterity. Toys like rattles or maracas, pianos or xylophones, or even a clever spinning toy we call the whirly gig. These provide pleasant feedback that make them fun even for an adult. Earlier on, she loved her activity mat for this reason. We picked the Skip Hop Baby Treetop Friends Activity Gym because it has no batteries and all the jingling sounds the animals make are actually pleasant to hear for hours. Third, chew toys help a lot with teething. This is any toy or item that is okay if the baby puts it in their mouth. For us, baby spoons were one of my daughter’s favorites for a long time. This also helped her learn spoon mastery before solids. If you want more suggestions, you can stop by a local toy store like Shenanigans in Charlottesville and ask the employees what their most popular toys are. My mom has found some of my daughter’s favorites this way. Lastly, I’ve been interested in Cricket Crates, which is a monthly subscription to arts-&-crafts-style science projects. They ship a new crate to your door monthly. I have not tried it yet because they are developing my daughter’s age group, but they have got 24 months through 16 years developed. If any of you try it, let me know how you like it. You can also bless your grandbaby by blessing their parents. Coupons for a home cooked meal or help with cleaning or laundering are amazing. Put ideas for the day you can come on the card, so they know when it is okay to cash in. Affirmations are also much needed. There’s a lot of judgement out there for moms and dads (probably some even accidentally from you! ), and finding ways to say that you are proud of them is powerful. A well-written card can fill this gift or something craftier. Mommy & me classes (baby friendly adult activities) are also a dual gift. These exist at various gyms for things like swimming or dancing as well as at churches for Bible studies. If you hunt around, you can find them. Here’s a list from Charlottesville Family. Also, a 529 college savings account or even just a stock or two in a custodial account can be helpful savings. 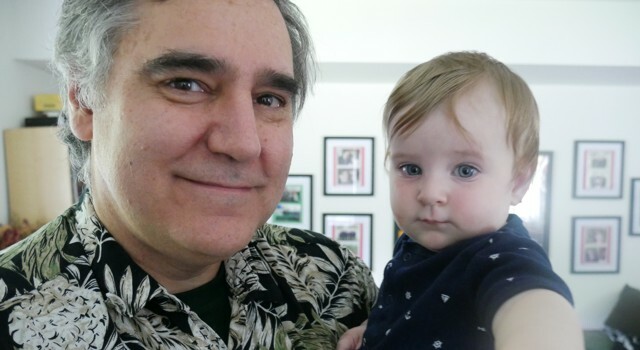 Photo of David John Marotta and his granddaughter by author. How Do You Value a Gift of Stock for Taxes?